Vatican City (Agenzia Fides) - The number of Catholics in the world is increasing: almost one billion and 300 million, 17.7% of the world's population. 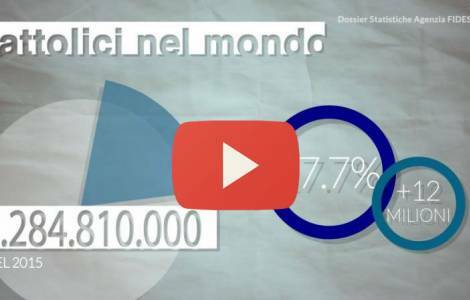 According to figures from the Church’s Book of Statistics (data related to 2015) and elaborated by Agenzia Fides, the baptized are 12 million and a half more than the previous year (2014). This is one of the data in the Dossier published by Agenzia Fides on the occasion of the 91st World Mission Day, which is celebrated on Sunday, October 22, 2017, which offers a panorama of the Church in the world. According to the Dossier, 1 billion and 100,000 people live in Africa, 19.42% are Catholics (222 million), with an increase of 0.12%. In America, out of 982.2 million inhabitants, 63.6% are Catholics (625 million), with a decrease of 0.08%. In Asia, out of 4.3 billion people, 3.24% of the population (141 million) are Catholics, an unvaried figure. In Europe, the population is increasing (716 million), but for the second year in a row, the number of Catholics is 39.87% (285 million), a decrease of 0.21%. 38.7 million people live in Oceania, 26.36% are Catholics (10.2 million), with an increase of 0.24% compared to the previous year. The Catholic ecclesiastical circumscriptions (dioceses, vicariates, apostolic prefectures etc) in the world are 3,006 (+ 8 compared to 2014): 538 in Africa, 1,091 in America, 538 in Asia, 758 in Europe and 81 in Oceania. The number of Bishops in the world increases by 67 units (5,304) while the number of priests decreases by 136 units (415,656). Fides’ Dossier also informs that there are 351,797 lay missionaries in the world while 3,122,653 are catechists. The Catholic Church runs 216,548 schools in the world, attended by over 60 million pupils. In addition, almost five and a half million young people attend Catholic institutes during high school and university studies. Finally there are about 118 thousand Catholic social and charitable institutes (hospitals, Care Homes for people with Leprosy, orphanages, homes for the Elderly) scattered throughout the world. In Fides’ Dossier there is also an overall picture of the missionary cooperation activity of the Pontifical Mission Societies (Propagation of the Faith, Saint Peter the Apostle, Missionary Childhood, Missionary Union) which, in their support to local Churches (building of chapels and seminars, education, pastoral and formation activities), granted subsidies which amount to 134 million US dollars in 2016.